Glass elevators provide spectacular views of snow white beaches and emerald colored waters. 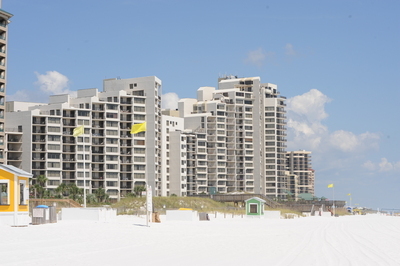 Beachside I and II has a variety of floorplans from efficiencies to three bedrooms and even penthouses. It’s large, private pool deck adjoins The Beach House restaurant and it boasts a private dune walkover to beach.